Permata Gayo was founded in 2006 in the Bener Meriah district of the Aceh Province in Sumatra, Indonesia. Thread had the chance to go and meet with these farmers last March, and we are very excited to have a relationship with them. On our trip, we spent several days visiting farms, attending their meetings, and visiting the warehouse where the coffee is sorted (pictured above). Above is a photo of Sukamto, a Permata Gayo farmer in Tunjung Sari, Aceh, who we met with on the visit. While showing us his plants, he told us about some of the problems they'd been experiencing that season with the the pests, less predictable rainfall, and also shared new techniques they were using with adding compost to the soil. Despite a few of the plants he was worried about, he had some of the healthiest coffee plants we'd ever seen - big, green, lush and 100% organic! At around 1600m, the conditions are ideal for growing Arabica coffee in the Aceh region - rich, volcanic topsoil with a good amount of rain and sun. 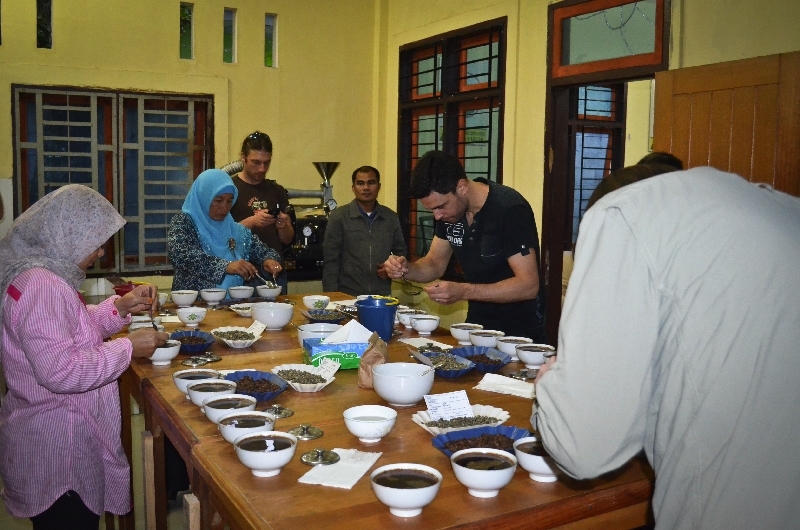 On the trip, we sampled coffees from different villages that make up Permata Gayo - the cooperative has over 3000 members in 36 different communities - the coffees vary from village to village, and farmer to farmer. We give this particular coffee a medium roast to bring out the full, earthy body, and hints of caramel. It makes an excellent cold brew coffee, so check out our brew guide!